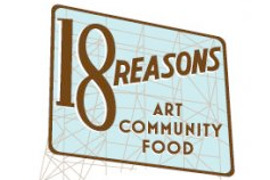 Buy a $50 membership to 18 Reasons and they’ll devote 100% of the proceeds to create an at-risk youth scholarship program to All Plant Parts, a healthy eating summer camp in partnership with Slow Food San Francisco. 18 Reasons and Sanchez Elementary School are excited to partner on All Plant Parts Cooking and Gardening Summer Camp. Perfect for the budding farmer and chef, the camp will focus on the science and art of growing and cooking edible plants. We will start with seeds and roots, make our way up stems and then out to leaves and flowers. Each day campers will get their hands dirty both in the garden and the kitchen, and use lessons from both to make their snack and lunch. That means all food is included at camp! All Plant Parts is part of an on-going relationship between 18 Reasons, The Sanchez School, and Slow Food San Francisco. Together we are teaching kids how to enjoy growing, cooking, and eating healthy and delicious food. For more information, please e-mail 18 Reasons at: info@18reasons.org. 18 Reasons will devote the proceeds from the Carrotmob campaign to create up to 4 scholarships for low-income kids. Any proceeds raised beyond 4 scholarships will cover camp programming costs like ingredients and teachers fees. You can buy as many membership vouchers as you like. Upon purchase, you will be asked to enter additional membership information in a online form managed by 18 Reasons. You can purchase a membership voucher as a gift - simply specify that the membership voucher is a gift on the online form. Memberships are for one year only and may be renewed through 18 Reasons. For any additional questions, please contact Carrotmob at: support@carrotmob.org. Membership is AWESOME - just check out these Yelp Reviewers! And now, with the help of Carrotmob, membership is about to get a lot more rewarding…. Proper nutrition is essential to children's development, advancement, and good grades in school. And with obesity at an all time high amongst lower income students, the need for proper nutrition education is immense. Carrotmob is teaming up with 18 Reasons to teach kids about healthy eating! When you purchase a membership, 100% of all proceeds (yes, you read that right! 100%!) will go towards funding and expanding a scholarship program for Cooking and Gardening Summer Camp: All Plant Parts. The scholarship will assist at-risk and low income students who want to attend the camp to help them understand the value of proper nutrition and learn to create healthy meals. All Plant Parts is an interactive program for kids focusing on the science and art of growing and cooking edible plants. Each day campers will get their hands dirty both in the garden and the kitchen, and use lessons from both to make their snack and lunch. All Plant Parts is a partnership of 18 Reasons, the Sanchez School, and the Slow Food Movement. With the help of Carrotmob, we can empower everyone, regardless of background and financial ability, to learn the importance of eating well. Join us for an optional Carrotmob event at 18th Hour!, an evening with music, art, bites and drinks on Thursday, April 4th from 6pm-10pm. Take BART to 16th St, or MUNI lines 33, 14, 49, or 22. Or bike! :). 18 Reasons is Bi-Rite Market’s community food space to learn, think, and do on 18th Street. 18 Reasons hosts member exclusive events such as wine and food tastings, gallery openings, and skills classes. Learn more here. Is 18 Reasons any good? These Yelp reviewers seem to think so. And so does Carrotmob staff. 18th Hour on Thursday nights are a staff favorite! 18 Reasons membership gives you access to a whole host of benefits and activities including wine and food tastings, skills classes, and local business discounts. Learn more here. Once you have bought a voucher, you will automatically become a member and be contacted by 18 Reasons with all of your membership goodies! It’s that easy!